I started The Packafoma Post primarily as a video production blog, but sometimes my obsession with aviation sneaks in as well. A better VFR flight planner, featuring a simple layout with radio frequency column. As a student pilot, I relied on the Jeppesen flight planning sheets that I found stacked next to the photocopier at my Santa Monica flight school. They were free and adequate. I am extremely picky when it comes to flight preparation, however, and as I learned more, I became less satisfied with the forms. They made very poor use of space and lacked an area for radio frequencies or runway information. I tried some alternatives from ASA and Dauntless, but I disliked them even more. The well-advertised offering from Dauntless deserves credit for ingenuity, but I’m pretty sure if I ever actually used their origami style of flight planner, I would end up performing some unintentional aerobatics. Keep in mind that I am someone who went through five flight bags in my first few months of training before I found one that I liked, and that was after making a lot of special modifications myself. The same remains true for pretty much everything from flashlights to kneeboards to sunglasses, all of which take on more gravity — pardon the pun — when you start flying. 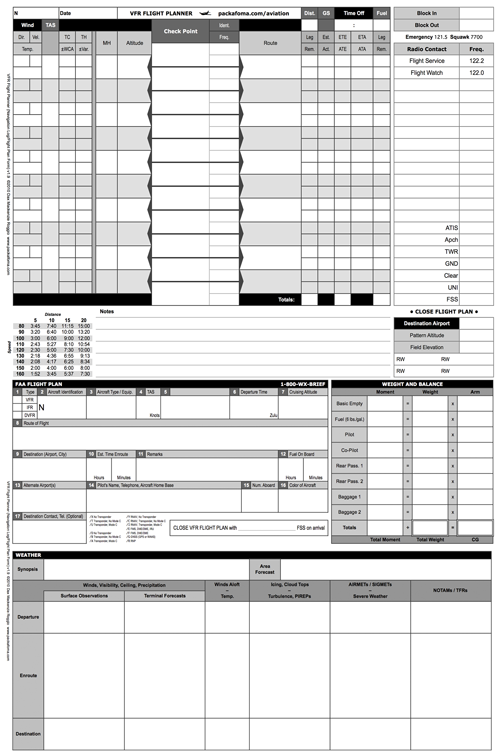 So not long after I got my private pilot certificate, I decided to create my own flight planning form. I kept it as simple as possible but spent many hours fine-tuning every inch. I have been using it ever since. It was worth the time just for my own use, but I think a lot of pilots will find that it’s an improvement over the commonly available flight planners. I’m a tech geek, and I appreciate that a lot of pilots are using electronic flight planning methods these days. An iPad is a great addition to any flight bag, but I still prefer to plan most flights with a pencil and paper. I feel like this forces me to learn the route as I create it, which is why I found it particularly helpful as a student pilot. You’re welcome! Good luck with your training! Excellent organization and included info. But it looks like the NavForm is intended to be used in 8.5×11 landscape format, which is 2x the width of a knee board. If I had a native version of this file, I might combine Route & Alt and attempt to move things around so I could fold the form into planning and flying sides. What do you think? Thanks, Bill. When I designed the NavLog, I did consider the 8.5×11 size to be less than ideal, but I concluded it was necessary to avoid other compromises. I usually fold the wind calculation columns along the left side back out of the way before flight, which makes the page a little smaller, but it is still wider than a kneeboard. Email me at the contact page address if you are interested in the original Excel file. outstanding vfr card. thank you. Your design is excellent and solves problems that have been bugging me for 15 years!! That’s wonderful to hear! Before designing it, I had tried every flight planning form I could find, including all the standards, but every one had flaws in organization and layout that drove me crazy. So I finally gave up and started from scratch on my own design. It’s always great to hear from pilots who appreciate it! It’s nice to see that in this age of all things digital I am not the only old pilot that still believes in paper.It requires no batteries nor links or constant costly upgrading.I remember the time when cut and paste meant exactly that;}I found this a couple of years ago and still use it as my main planning and as the backup to my onboard electronic Nav equipment.Like I said no batteries required. Thanks for taking the time to leave a note, Joe! It’s always nice to hear from pilots who appreciate the no batteries required flight planner, especially when they have been using it for years! This VFR flight plan form is very helpful. It lays out all of the essential elements for basic navigation, regardless of whether by Ded Reckoning, Pilotage, VOR/ADF navigation, or GPS navigation. Thanks. It’s a great instructional aid to help students understand the basics of cross country navigation (other than “follow the magenta line”). FWIW, that colorful line is very fragile. It can easily disappear should the satellite constellation become unavailable… a possibility many of us don’t seriously consider in our flight planning exercises, an electrical failure occur in flight, iPad’s over heat, etc., etc., and etc.. I just found these. They look great, Thank you very much. Could you please explain the “Route” box/cell. What are some examples of things you would write in there. That’s a great question! My most common use for it is to note the airspace restrictions for that leg. For instance, I’ll write Class B 5000 as a reminder to stay below 5000 feet. I also frequently note a VOR radial, such as To MZB 158° or describe a landmark to follow or look for, such as Stay east of PCH. It’s also a good place to note MOAs or other restricted airspace along the route.